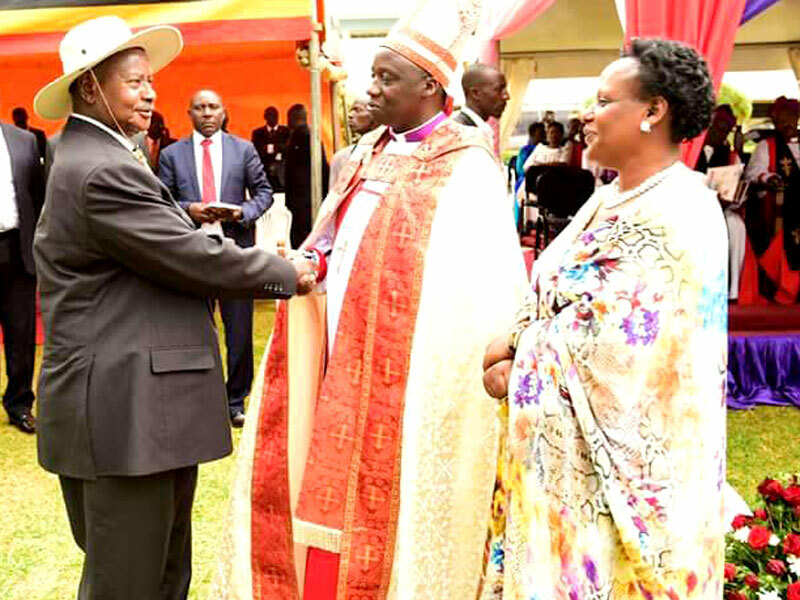 President Museveni congratulates Bishop Twinomujuni. BUSHYENYI. The Rev. Canon Johnson Twinomujuni was yesterday installed as the fourth Bishop of West Ankole Diocese ushering a new chapter of the hitherto divided diocese. In a show of solidarity and unity that is set to give the new bishop a smooth takeover, Christian faithful from both Sheema and Igara, whose differences had been at the centre of the divisions, participated actively in the preparations. Ministers Mary Karooro Okurut (General Duties), from Igara, and Ephraim Kamuntu (Tourism), from Sheema, co-chaired the organising committee, with Yesse Mubangizi, from Sheema, as secretary. The Sunday ceremony at Bweranyangi in Bushenyi was attended by several dignitaries and President Museveni was chief guest. The President asked church leaders to participate actively in wealth creation programmes, an initiative being spearheaded by the army. Bishop Twinomujuni and wife Joy are consecrated. Museveni handed over a brand new Pajero vehicle to the newly installed bishop. Bishop Twinomujuni pledged to work for the unity of the diocese. He called on all the faithful in the diocese to render him the support needed to spearhead development. Munister Karooro also preached unity ahead of the new chapter for the diocese. Bishop Twinomujuni, who was last month elected by the Church of Uganda House of Bishops, will succeed the Most. Rev. Stanley Ntagali, who has been the acting Bishop of the Diocese since the Rt. Rev. Yonah Katoneene retired in October 2016.
ashaari, Mbarara District. He was born again on August 15, 1986, during a mission at his church in the school holiday. After completing Senior Four, Twinomujuni began full-time ministry as a youth worker in Rutooma Archdeaconry, during which time he also completed a certificate in Theology at Kinoni Divinity College. In 1992 he completed teacher training at Bishop Stuart Core PTC, where he also met his wife, Joy. They were married in 1992 and both began teaching at Rutooma Integrated Primary School. In 1994, Canon Twinomujuni was admitted to the African Bible College in Malawi where he earned a Bachelor’s Degree in Biblical Studies. Upon returning to Uganda, he was ordained a deacon in December 1998, and a priest in December 1999, and returned to Bishop Stuart PTC as a chaplain, as well as serving Kibingo Parish as their parish priest. In 2002, Canon Twinomujuni completed a Master of Arts degree in Christian Education from Reformed Theological Seminary in Jackson, Mississippi, US, and returned to Ankole diocese to serve as the diocesan missions coordinator. In 2004, he was appointed to Uganda Bible Institute, a theological college he helped establish, and where he currently serves as principal. In 2013, Canon Twinomujuni completed his second Master’s degree in Organizational Leadership and Management from Uganda Christian University. Canon Twinomujuni has also served as chaplain at Mbarara University of Science and Technology, a part-time lecturer at Bishop Stuart University, and many other positions of leadership in Ankole Diocese and the Province. Canon Twinomujuni is married to Joy Twinomujuni, a teacher, with whom he has six children.